I loved your SAHM capsule – any chance of you doing something similar for the Road Warrior? I have worked with the concept but still am missing a few pieces that I can't for the life of me figure out what they are. I got a new job in November that will have me traveling quite a bit this spring. I will visit client sites, and will be away from home for up to three weeks at a time. I haven’t had to travel for work before more than a couple days or a conference and have no clue how to do this. My coworker is a man and he says he keeps his suitcase always packed and ready to go, how does a woman make three weeks of professional clothing fit in one carry on suitcase? HELP! In my past career lives, I did travel for business. While I was never away for more than a week, I often saw the same clients multiple times in a month, and often only had a week between trips before I was again on the road. It may seem daunting to look professional and pack smart, but it is possible. These days professional attire is found with Lycra, spandex, and fabric blends that make it comfortable and travel-friendly. Matte jersey, stretch wool, ponte knit, crepe, and gabardine can be your friend when you are a road warrior. 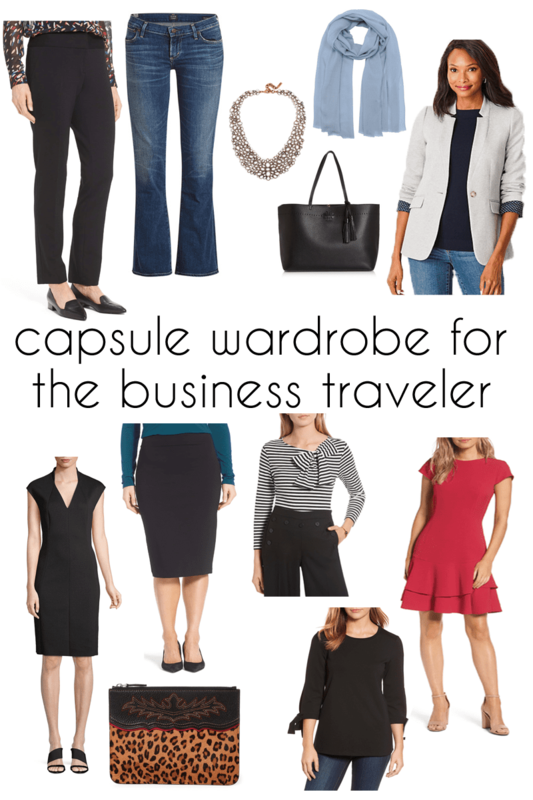 I made a sample capsule wardrobe based upon my experiences with business travel. Only the suit in this capsule is high-maintenance fabric; pack wrapped in dry cleaning bags to prevent wrinkles, hang up as soon as you arrive and it should be okay for the big presentation. The rest are work-appropriate separates that all have some sort of stretch to keep them looking great right off the plane or train or out of the suitcase. Lots of ponte separates. I’m a ponte addict, I can’t deny it. Heavyweight knit that works year-round, doesn’t wrinkle, and can be machine washed. Pretty spectacular. On top of that, it looks refined enough for the workplace. In this capsule I have black ponte pants, a ponte blazer, black ponte dress, black ponte top, and gray ponte skirt. Since they are the same fabric, they mix and match with ease and the combinations looks more like ensembles. Ponte is also great when you have to fly or take the train and immediately head to a business meeting – you won’t be full of wrinkles and will be comfortable sitting for long spans of time. Strategic pops of color. While it seems smart to pack an entire suitcase of neutrals, that can look pretty boring pretty quickly. 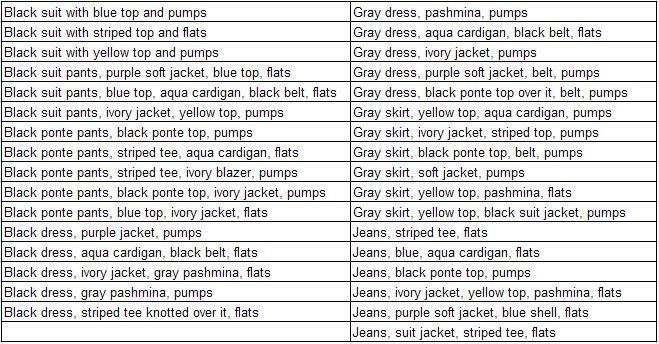 Choosing suit shells and soft jackets or cardigans in colors will stretch your neutral capsule further. Mix two for a bold look, or just have one piece to give a neutral you already wore a new life. The choice of color is dependant on your personal style and profession. For more conservative fields, consider softer or more traditional hues; if you’re in a creative field you can amp up the color and even add more to the capsule. Stick to solids. While prints can break up a wardrobe monotony, they are also so incredibly memorable that you can’t easily wear the same print twice with a client. If you are in a more casual or creative field, you can consider a print like leopard for some accessories, but having solids for your Road Warrior wardrobe means you can likely wear the same garment twice in a week without a client being the wiser. Choose pieces that can dress up and down. While you may be meeting with clients and needing a professional wardrobe, not every moment of your day is suit-worthy. Maybe you’re meeting colleagues for happy hour, or your client is taking you to a baseball game. Be ready without having to stuff a suitcase with a casual wardrobe. A striped tee with a flattering neckline and fabric can be dressed up under a suit jacket, or paired with jeans and flats for a barbecue or sporting event. Pair the jeans with the cardigan for a casual meal, or with the ivory blazer (maybe tuck a band tee shirt or simple tank into your suitcase) or just a sweater shell with pashmina or statement necklace for drinks at a neighborhood bar. As for dressing up, a ponte or crepe dress can work for the office or for a cocktail party. The black dress I featured could work with a blazer or cardigan by day and with red lips and mascara will make it perfect for an evening affair. Use the pashmina as an evening wrap. Pack smart accessories. 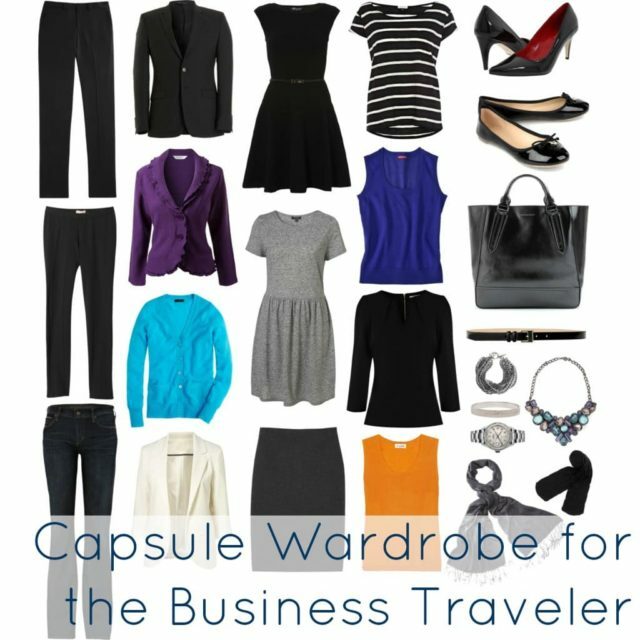 While I am all for having a large accessory collection for changing the look of wardrobe staples, when you’re a Road Warrior you need to keep your wardrobe to a minimum and keep it super easy. A statement necklace that isn’t too sparkly or too arts and crafty can jazz up a classic suit, or dress up a work dress to look cocktail appropriate. A pashmina can be your travel blanket on the plane, add interest to a simple dress or ensemble, be your evening wrap for a cocktail party, and ward off chill in overly air-conditioned office buildings. If you know you will be there longer, consider wearing tall boots on the trip for they will give a completely different look to skirts, dresses, jeans and narrow pants. Finally, choose a structured and polished bag to be your purse, your carryon bag, as well as your work tote. Find one that can hold both your laptop as well as a bottle of water and copy of InStyle for the flight. Pack repair and care supplies. Stitch Witchery, a small sewing kit, bar of Ivory soap or a small bottle of laundry detergent, Shout Wipes or Tide-to-Go pen, safety pins, a black Sharpie (covers snags in tights and fabric, tears in leather, etc. ), lint remover. When I used to travel on business, I had my toiletries kit already packed and ready to go with mini versions of all my beauty products, and I also had an emergency outfit kit in a small bag with these essentials. Both stayed in my suitcase when I was home, only removed to replace that which ran out. This way, I never forgot them and was already ready for any situation (or any stain). Most hotels have a shine cloth for shoes and an iron to get out wrinkles and fuse Stitch Witchery. That’s an amazing article Alison and I find these tips are quite useful for my upcoming trips, as a business traveller, I use to carry a lot. I really like your word on smart packing. Thanks for the great share. And I do like your other articles, keep up the good work. Cheers. I know this is old news, but I wanted to add a couple of hints for the next fashionable road warrior to come along. Get a bag or tote with a zipper on top. This will keep your stuff from rolling all over the floor of the plane, train, or automobile when your bag tips over. It’s also safer from pick pockets. Get a little wallet style purse with a detachable strap. When traveling, put it in your bigger bag as a wallet and pack the strap. Then attache the strap and you have a separate and not nearly as heavy purse for dinner or any time you really don’t want to lug around your laptop and papers. Pack a tiny (less the 4oz) spray bottle of unscented febreze. Brilliant for freshening up your clothes between washing. When you get home, immediately inspect all your gear. Wash / dryclean your clothes, maintain your shoes, restock your toiletries. I don’t repack because stuff gets wrinkled, but I do keep a spot in the closet and drawer for those items so that I can pack easily without forgetting stuff.